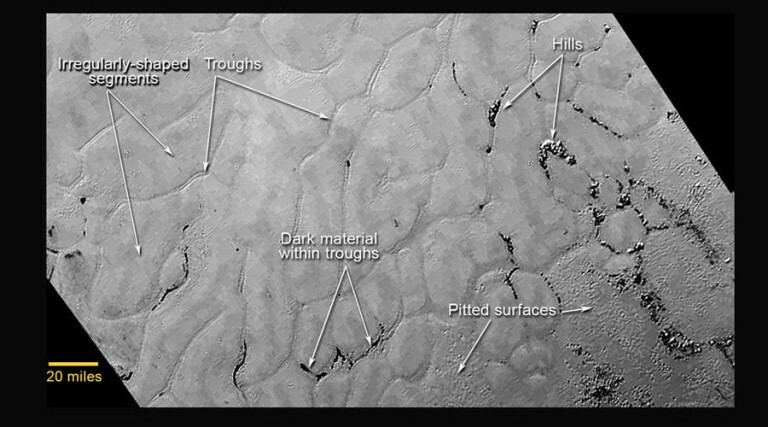 Look at these traces of rilles winding the surface of Pluto. We’ve seen this on Mercury, the moon and Mars. We’ve seen it on the moons of Saturn. Now we see them on Pluto and its largest moon Charon. What would cause these? Planetary scientists with the New Horizon’s project theorize it is because Pluto has a water ice core that has been seismically active in the recent past. The New Horizon’s team acknowledges this surface looks very similar to surfaces seen on Mars, where they attribute the polygonal structures to be caused by subsurface lava tubes that have collapsed. The assumption Pluto has a water ice core requires a different explanation for its rille features. On Pluto, it is believed these twelve mile wide polygons are either convection cells, presumably frozen into the surface as the planet cooled, or they are the consequence of contraction stresses as the surface shrank, analogous to the polygonal cracks in dried mud. Many rilles also exhibit circular craters that seem to appear in clusters along the path of the rille. New Horizons also photographed the same features on Pluto’s largest moon Charon. According to New Horizons researcher John Moore, “When you look at this plain you can see a vast, craterless plain with some strange story to tell.” He added that he first thought the only way to describe the plain was as “not-easy-to-explain terrain”. The Electric Universe provides a different theory for these features and many other observations we can see in the earliest photos streaming from Pluto. The rilles appear to be “breakdown” channels from high-energy electrical discharge events. Other features found on Pluto have the New Horizons team giddy with wonder and astonishment, since these features are a complete surprise. The Electric Universe wonders at the New Horizons team’s surprise since these features are consistent with the features of other rocky planetary bodies we look at. Pluto’s surface is red, very similar to the appearance of Mars. Tombaugh Reggio, as named by the team, is the distinctive heart shaped region of flat pain where the rilles appear. Other photos of the region show clusters of hills, surrounded by flat plain. Parts of the plain show mounds. More data streaming in should determine the size and shape of the mounds. Adjacent to the flat plain in the southern hemisphere are eleven thousand foot mountains. New Horizon scientists theorize these are composed of bedrock water ice, tectonically up-thrust from the water-ice core. The surprising elevation on such a small body implies they are structurally solid bedrock ice with a coating of nitrogen ice deposited by winds. Dark streaks several miles long appear to be deposits that researchers think is wind blown dust or perhaps evidence of past geyser activity. There is a huge concentration of carbon monoxide within the Tombaugh Reggio. No other concentrations of carbon monoxide appear across the surface. Elsewhere are deposits of nitrogen and methane ice. There are few craters and some areas are almost completely without craters, which is an unexpected find that suggests to the researchers Pluto was formed within the last 100 million years. Since Pluto is not close enough to another large body for tidal forces to create tectonics, it is now thought Pluto may have been hot and active in the recent past due to internal stresses. Pluto has an atmosphere that reaches a thousand miles into space. Spectrographic analysis indicates a mixture of nitrogen and hydrocarbon sandwiched between molecular nitrogen in the upper atmosphere and hydrocarbon at the surface. A tail of ionized nitrogen plasma blows in the solar wind from Pluto, extending 68,000 miles into space. New Horizons team estimated this tail is the result of solar winds stripping as much as 500 tons per hour of Pluto’s atmosphere. This is far more energetic than anything they expected to find. Mars was found to have a plasma tail carrying an estimated 1-ton per hour of material, in spite of its proximity to the sun. A large dark spot, named “Mordor” by the team, appears to be a thin veneer, surrounded by a reddish outer ring. A series of troughs and cliffs extending six thousand miles across the surface. Vast smooth areas without craters. A long linear canyon estimated to be four to six miles deep. Another canyon 3 miles deep. No highly cratered surface as expected. The New Horizons team and NASA have done a spectacular job in getting this data. The successful LORRI CCD camera is providing long-range detail with amazingly high resolution. Unfortunately, they are already jumping to conclusions, trying to explain Pluto’s features with standard model ideas. The New Horizon team may wish to expand their horizons a bit further than they do now if they want answers. They will find these features explained – even laboratory demonstrated by the EU Theory if they dare to look. As more pictures and data comes in, we suspect there will be more similarities to the features of Mars and our moon, and few features that match the standard model. For more information on Pluto, see New Horizons Update: Pluto and Planetary Origins| Space News with Wal Thornhill posted July 24, 2015. The Thunderbolts Project Patreon Campaign Continues!